Following disagreements over upcoming Fleetwood Mac tour dates, the band has fired longtime guitarist, singer, and songwriter Lindsey Buckingham, according to Rolling Stone. Though not a founding member of the group, whose lineup changed often from its formation as a blues rock band in 1967 to 1975, Lindsey Buckingham and his musical (as well as romantic) partner Stevie Nicks joined the group to create its most popular lineup. Buckingham’s "Go Your Own Way," along with Nicks’ "Dreams," helped break the band into the mainstream upon the release of Rumours, one of the best-selling records of all time. The often-acrimonious relationships within Fleetwood Mac have been a near constant presence in its history, with Buckingham previously leaving the band in 1987 before returning in 1996. 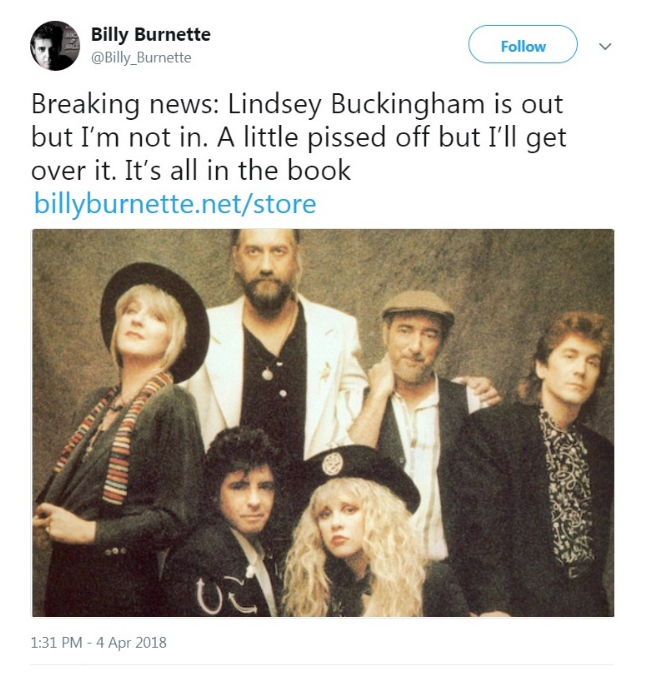 Buckingham’s former post-1996 replacement Billy Burnette first broke the news on Twitter, when he said, “Breaking news: Lindsey Buckingham is out but I'm not in,” before deleting the post. According to a statement Fleetwood Mac gave to Rolling Stone, Buckingham will be replaced by the Heartbreakers’ Mike Campbell—who has shown off his vibrato technique in the Reverb studios before—and Neil Finn of Crowded House. In their statement, Fleetwood Mac said, "We are thrilled to welcome the musical talents of the caliber of Mike Campbell and Neil Finn into the Mac family. With Mike and Neil, we’ll be performing all the hits that the fans love, plus we’ll be surprising our audiences with some tracks from our historic catalogue of songs. Fleetwood Mac has always been a creative evolution. We look forward to honoring that spirit on this upcoming tour."